Currently 79% of businesses do not have a Mobile Website – meaning that when they are searched for on a mobile device their website may appear unreadable or ugly, losing them business. 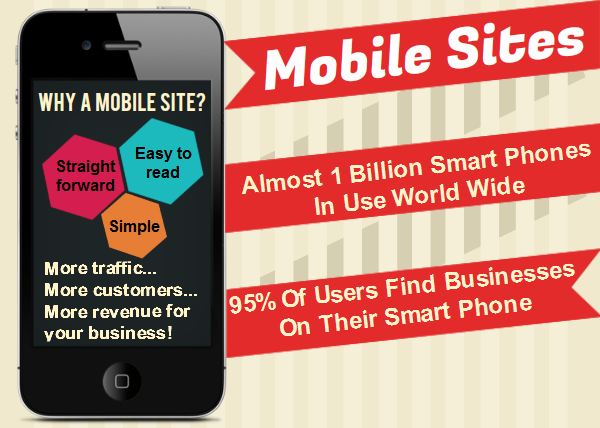 Stay ahead of your competitors by making yours a mobile site! Mobile phones are being used more and more to browse the internet – in fact by 2014 it is estimated even more so than computers. Nearly all Smartphone users find local businesses using their phones, making them a vital tool for your business. Having a mobile site means that you have increase your chances of being found by customers in your local area. Make your business even more accessible by having a mobile website. This is the fastest growing technology at the moment with more and more people browsing the internet on their mobile devices. A mobile website is important in order to get your business available, quite literally, at potential customers finger tips. 88% of mobile users will take action to call or visit a business they find, which quite simply means more potential revenue for you! If somebody is searching on their mobile then it means that it is more likely they are looking for something for RIGHT NOW, and in their local area. Do not miss this fantastic opportunity to beat your competitors! Contact Us today.